Got a successful travel blog or you are thinking about launching one? This roundup list of the top 5 travel affiliate programs I will be talking to you about today is what you need to start making some decent commissions with your travel blog. 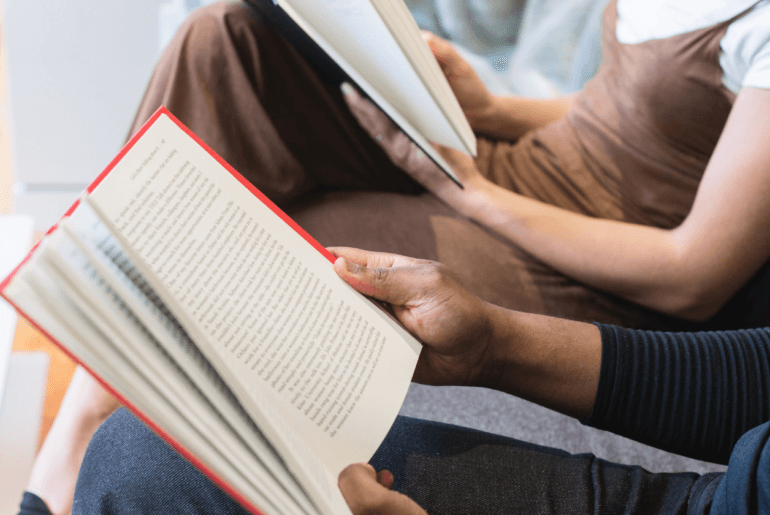 As you will see from this blog post, the travel is industry is booing online – some would even say that the travel industry only works online these days with the era of brick and mortar travel agencies shrinking by the second. AirBnb was a major boost for the travel industry online, so was TripAdvisor and Booking.com. While there is no confirmation yet that AirBnb will launch its own affiliate program, TripAdvisor and Booking.com (amongst others) are offering fantastic commission rates on everything from selling flights, booking hotels, to cruise line packages and much more. This roundup list of travel affiliate programs will be sure to find you a program to partner with and make commissions. Obviously, there are much more than 5 travel affiliate sites, but this roundup list will give you a clear idea who the market leaders are and what to expect when you start promoting travel offers online. In this mini-review, I will go through each of the listed affiliate programs giving you what type of affiliate commissions you can expect and I will also be showing you further down below the many ways you can make money promoting travel affiliate programs. As I said, it’s a big world out there with online travel booking engines making “travel” accessible to billions of people across the world. Who Can Use These 5 Travel Affiliate Programs? Any blogger or site owner that is focused on travel will find these affiliate programs useful. There are many areas and sub-niches of the travel industry that you can go in and make some money with so there are many opportunities for a variety of bloggers and webmasters to make some commissions by referring your readers/customers to brands that they already know and trust. Who Will Benefit The Most From This Guide? Anybody wanting to learn about the online travel industry can learn from this guide how to best present their offers and more importantly, how to promote travel offers to an online audience. I have a section further down below showing you all you need to get started in the travel industry as an affiliate. 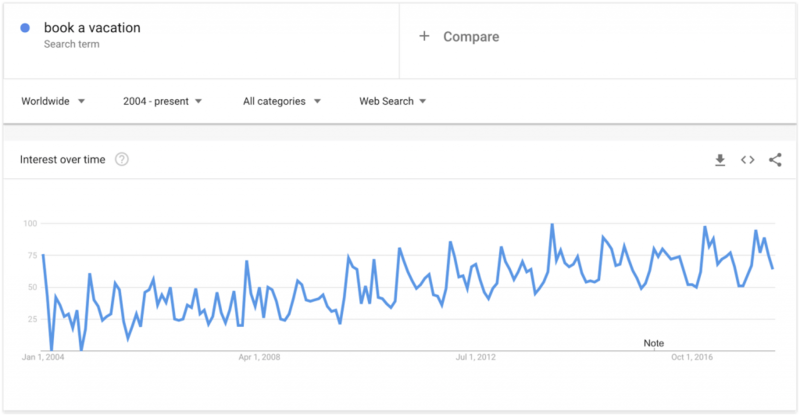 Here are some screenshots thatare taken from GoogleTrends tool that show the speed at which this industry is growing online. As I said, I do not see a reason why (and how) the travel industry can survive outside the online digital world. Booking.com has become the Facebook of travel as it’s today synonymous with hotel bookings, car rentals and air tickets which are all essential parts of any journey. They also have a generous affiliate program which is quite popular among affiliate marketers targeting travel niche. You’ll get commissions on the total revenue generated through your affiliate link, and as such you can sell all the offerings of Booking.com. You can earn money via Booking.com affiliate program by selling hotel bookings, flights, car rentals, and airport taxi. Booking.com offers a minimum commission rate of 25% which rises to 40% if your bookings per month exceed 501. Commissions are fixed at 25% for the first 50 bookings in a month and as such even new affiliates get this generous rate. -A generous commission rate of 25% for beginners which compares well with other travel affiliate programs. -One of the largest travel programs of it’s kind in the world. -Great banner options along with a search box. -A relatively high payout threshold of €100. -You’ve to wait for 60 days after the customer who booked through your affiliate link checks-out of the booked property to get your Booking.com account credited with the earnings. Who can use the Booking.com Affiliate Program? Booking.com affiliate program is open to users from all countries. Travelpayouts is a travel affiliate program mainly allows you to sell travel-related products. It’s been around for a while now and is considered among the best travel affiliate programs out there. Travelpayouts is focused on travel related items, although flight bookings are the mainstay of their product offering. It also allows you to earn money via other items in the travel niche such as hotel bookings, car rentals, airport taxi, and insurance etc. Travelpayouts allows you to earn a modest commission of 1.5% to 2.5% which is the industry standard for flight tickets. Other offerings offer higher percentages as you can easily earn up to 6% of total sales amount for hotel bookings and additional services. -One of the best travel-related programs out there. -Allows you to earn for multiple services and not only just for flight tickets and hotel bookings as is the case normally with most travel affiliate programs. 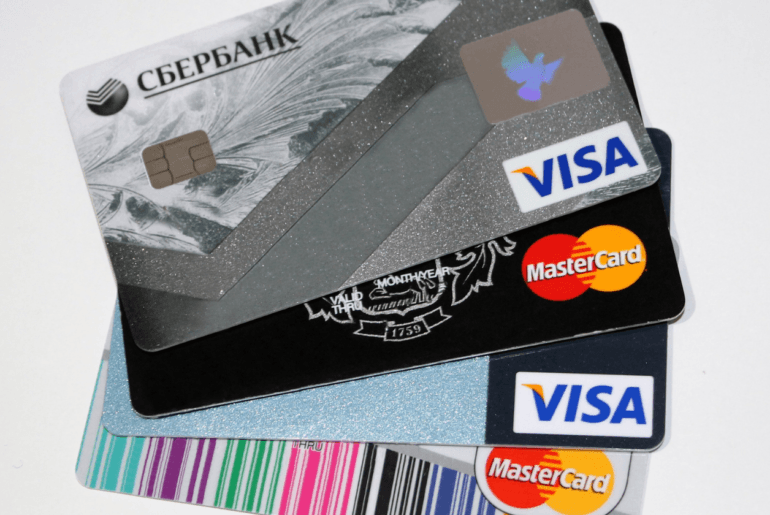 -Payment options are not attractive as only PayPal and Bank Wire are supported at present. -Relatively high pay-out thresholds of $50 or €40 for PayPal and $500 or €400 for bank wires. Who can use the Travelpayouts.com Travel Affiliate Program? Travelpayouts affiliate program is open to all types of users and you don’t even need to have a travel related website to participate in it. 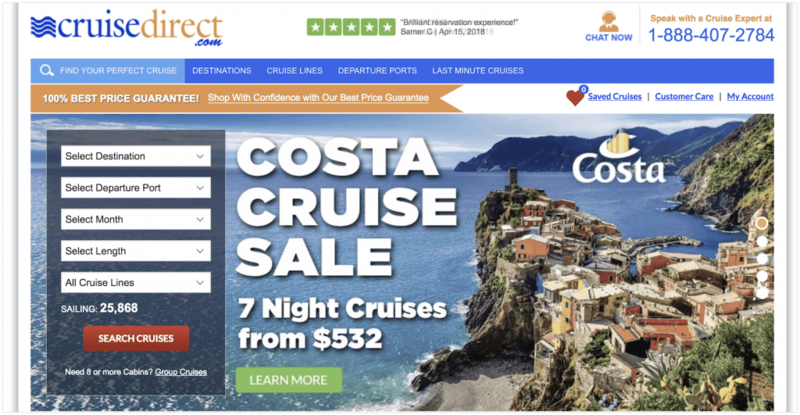 Cruise Direct is considered one of the best cruise affiliate programs out there. They offer cruises across all major destinations in the world and are renowned for their cheap prices. You can sell all the cruises ranging from Caribbean cruises to Mediterranean cruises and Asian ones. They work with several cruise lines and you can sell some of the most sought-after cruises after working with them. 3% may seem to be on the lower side when it comes to commission rate. You must not let simple numbers misguide you as cruises often involve multiple members of the same family or a social group. So, if 4 people book a cruise with a price of $800 per person, then the total sales generated will be $3,200 and your commission out of this will be $96. Indeed, not bad at all for a single sale! -Well designed marketing material including banner ads, search boxes, and text ads. -Cruise Direct affiliate program is available only via Commission Junction and you must get an account if you don’t have one already to participate in it. Who can use the Cruise Direct Affiliate Program? Cruise Direct accepts affiliates from all countries, although your site must not have any illegal content. Marriott is a well-known and recognized brand in the hospitality sector as they own hotels in several countries of the world. Indeed, Marriott is among the largest hotel chains in the world as they own 3,900 hotels in 72 countries and 15 brands. They also have a popular affiliate program which allows affiliates to earn money from their referrals. With Marriott Affiliate Program, you can earn money on hotel stays and vacation packages as these are the two main items offered on Marriott site. Commission rates vary across their two main products as you can earn commissions of 4% to 6% for hotel stays. While the commission rate for vacation rentals is fixed at around 3%. -Huge range of banner ads, search widgets, and text links. -Ability to promote all Marriott properties in West Europe and North America. -Payments are made only via Bank Transfers. Who can use the Marriott Affiliate Program? TripAdvisor has established itself as one of the leading travel sites in the world. At last count, it was the largest travel site in the world with around 315 million members and more than 500 million reviews of hotels, restaurants, and other travel-related businesses. They also have a popular affiliate program which has helped several travel site owners to earn a good amount of money. You can sell all the services offered by TripAdvisor such as hotel bookings, flight tickets, vacation rentals, and restaurants. Unlike other affiliate programs, TripAdvisor pays you based on the amount of revenue generated by your referrals and as such your earnings are not directly related to selling a product/service. TripAdvisor uses a different approach when it comes to affiliate commissions. Instead of being paid for a sale, you’ll get paid based on total revenue generated by users who came to TripAdvisor through your affiliate link. -Get access to more than 500,000 city and hotel pages. -Earn from both room costs and click-outs. -Excellent tracking and reporting tools. -Low earnings in general when compared with other travel affiliate programs. -Only available via Commission Junction. 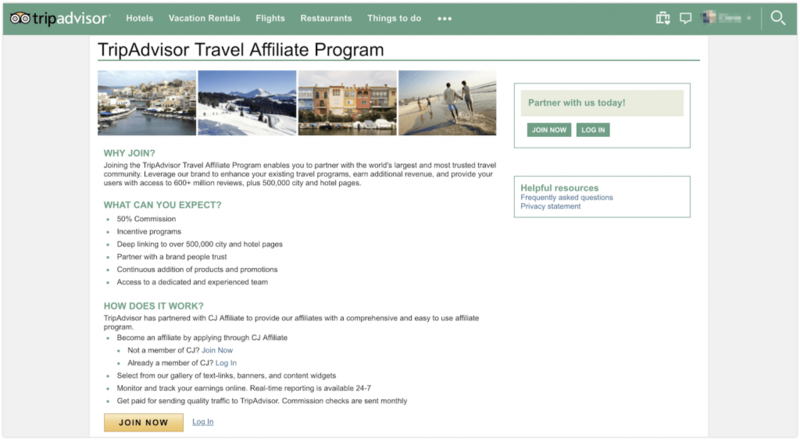 Who can use the TripAdvisor Affiliate Program? TripAdvisor is open to all interested affiliates from all countries in the world. I have studied the travel industry closely, not because I have a travel site nor am I a “travel affiliate” but because I am a fan of affiliate marketing and I know the kind of money travel affiliates are pulling. This is a must. If you want to have any chance of making money with affiliate marketing, you are going to need your own website. If you do not have one yet, be sure to get a free WordPress website here. You will need to buy hosting and a domain in the near future, but for the sake of getting started, I suggest you get a free website and start from there. 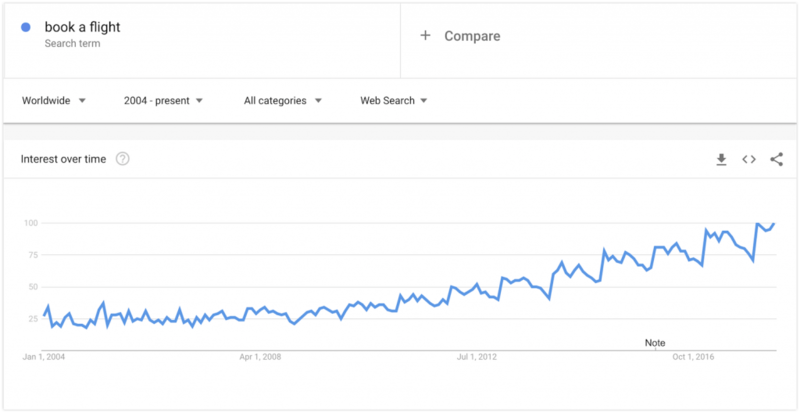 This will allow you to rank content on search engines. 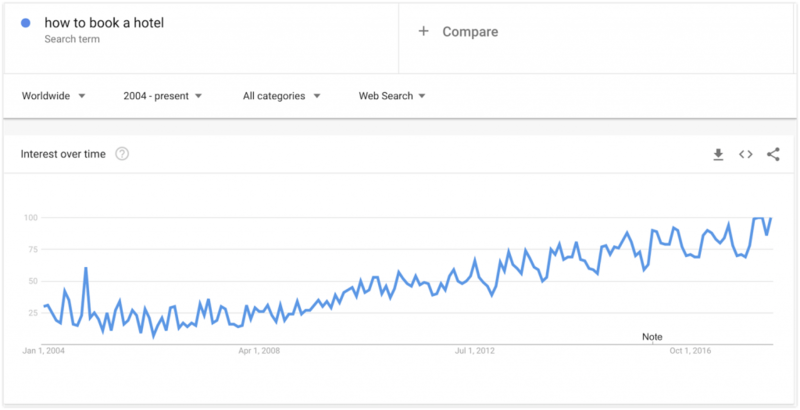 What this means is that you will find low competition keywords that you can target and get visitors to your site. What do you do with the traffic once you have it? You monetise it with some of the travel affiliate programs I have listed above. Want to have a travel blog that focuses mostly on trips to Asia? Then find the best affiliate offer for your niche and go with that but also remember, you can join multiple affiliate programs and you can promote multiple travel offers. With your own website, you are only limited by your imagination. Travel is all about experiences right? What better way to show the colourful experiences the world has to offer than by colourful Instagram videos? 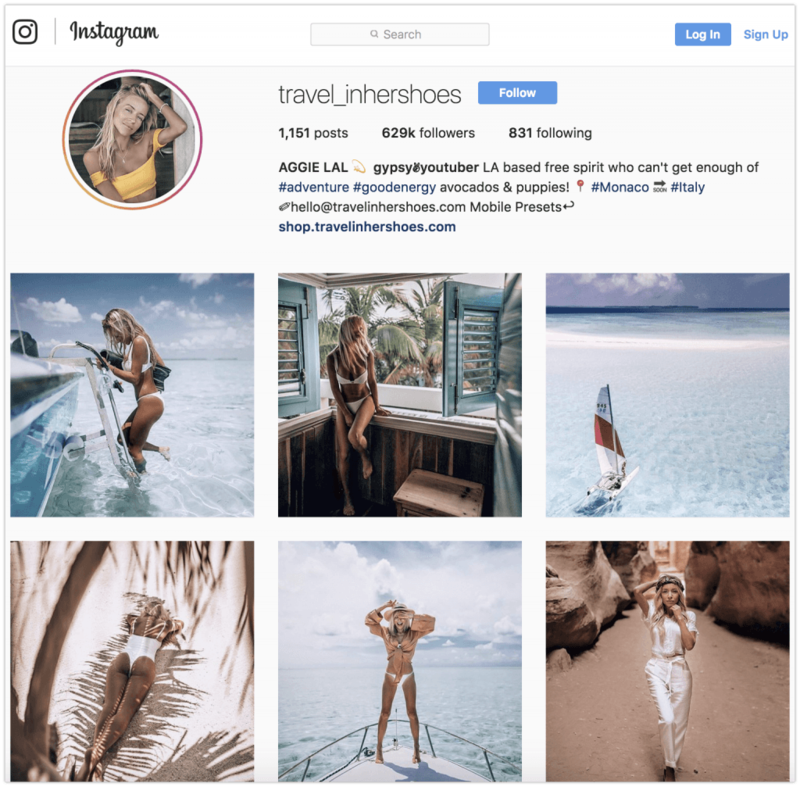 One travel blogger I really admire and like to follow (and I am sure she is making BANK as well) is @TravelInHerShoes. Another great way is through vlogging, which basically means publishing your guides and experience as a video blog on YouTube. 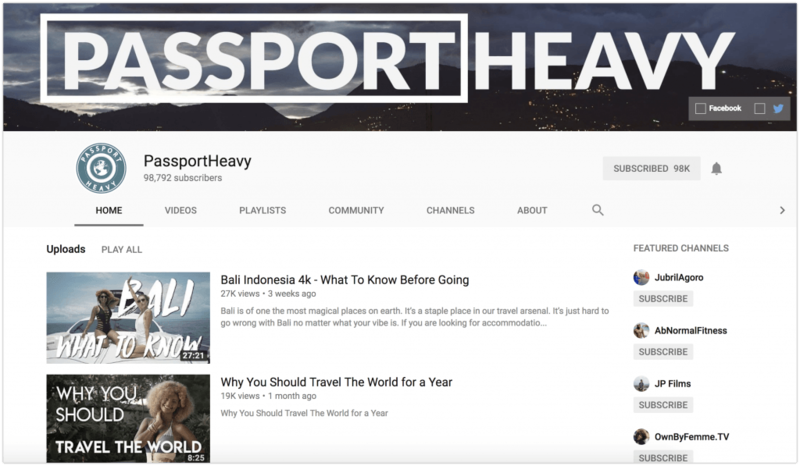 One of the best at this method is by far is PassportHeavy, an incredible YouTube travel channel that shows views various different experiences from all around the world. When it comes to travel, people want to hear your experience, so while you may not be an expert or a travel guru yourself, sharing your honest thoughts about a certain place or topic is more than enough to get you earning and making money. The YouTube channel, the Instagram account and the travel blog all are designed to do one thing, and that is generate buzz and views on your content. That same content can then be used to offer products and services that will eventually start making you money. How To Make Money As A Travel Affiliate? 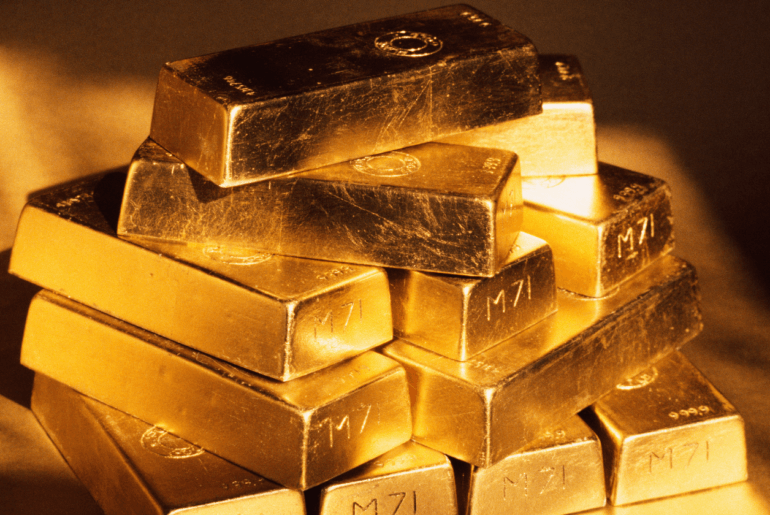 There’s a hard way and a less-hard way of making money with affiliate marketing. The hard way is going into it blind and then figuring it out along the way (sure way to spend years running in circles). The “lesser hard way” is going into this with the right mindset, the right formula and the right methods. For this, I suggest you take a look at Wealthy Affiliate. WA is an online training course for affiliates that will show you all you need to know and do to be earning. But why does it have to be hard? I am not in the business of promoting sure-fire ways to make a quick buck online. What I teach and show here is how to build an affiliate marketing business that lasts for a long time – as a real business should. It’s not easy, but it’s worth it – and you are going to need an affiliate marketing roadmap to get you there. Thank you for reading my roundup post of the best travel affiliate programs out there that you can promote. I will end it here as this post is already 2200 words deep and I know you are excited to go and get started building your online travel empire. If you have any questions, be sure to let me know and I wish you all the success. BuzzSumo Review: The Content Marketing Tool You Need?